What's up with the one green circle way off in the upper right? Error? That's HGDP00987 and I have no idea. I don't want to be dispararing, but why am I wrong in seing a shift towards chimps in some populations ? >> I don't want to be dispararing, but why am I wrong in seing a shift towards chimps in some populations ? Human populations occupy different positions along PC1 which differentiates archaic humans from chimps. So, what you see as "shift towards chimps" of some, can also be seen as "shift towards archaic humans" of the others. All humans are expected to be symmetrically related to chimps, because the human-chimp split took place 6 million years ago, long before the origin of Homo or Homo sapiens, so it is much more likely that archaic admixture rather than "chimp admixture" is generating the pattern. What's the point of using chimpanzee? 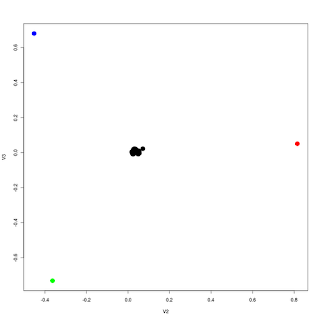 It seems to totally destroy the simplicity of the exercise, specially as you only have two axes in a PCA plot. "a shift towards chimps in some populations ?" Actually all the species (H. sapiens) shifts towards chimpanzees in comparison with Neanderthal and Denisovans. That's an effect of the very choice of chimps as fourth population and the massive weight of H. sapiens that tends to the center (0,0). Is that a Naxi furthest in the Neanderthal direction? I find intriguing that some african populations are shifted towards Denisova. Could this be a signal or archaic admixture to a group related to Denisovans? Denisova is towards bottom-left so I'm not sure what you mean. If Africans are closer to chimps, Eurasians to Neanderthals and Papuans to Denisovans, then Eurasians and Papuans are more modern than Africans, just like Neanderthals and Denisovans are more modern than chimps. Without ancient DNA from African archaics, it's not a fair comparative exercise. I mean that the dimension 2 is strongly negative in some African populations, and I interpret this as closer to Denisova. Does anyone know why the San appear so distant relative to other African populations? Is there any evidence using this PCA that East Asians are more closely related to Denisovans than other Eurasians, or Eurasians slightly closer to Denisovans than Africans, as some papers seem to suggest? If Africans are closer to chimps, Eurasians to Neanderthals and Papuans to Denisovans, then Eurasians and Papuans are more modern than Africans, just like Neanderthals and Denisovans are more modern than chimps. German, what is being shown is that Eurasians relative to Africans are more different from chimps in the same way that Neanderthals and Denisovans are different from chimps. It's not showing that Eurasians are more different from chimps overall, just that they are slightly more different along a specific axis that distinguishes Neanderthals and Denisovans from chimps. The actual distance of Africans from chimps is basically identical to Eurasians AFAIK. For comparison, if you made a PC-axis separating the San from chimps, the more dissimilar a modern human population is from the San (e.g. Native Americans at the furthest distance) the closer they would be to chimps along this axis, because the axis is measuring differences in the San that distinguish them from chimps and less related populations will have less of those... but don't necessarily have less differences from chimps overall. Other thoughts: It looks like modern humans as a group including Africans - Khoi San, West African, Pygmy - are slightly more shifted towards Neanderthals than Denisovans. I would guess that would line up with Neanderthals being closer in space (and probably time) to wherever it looks like the centre of modern human origins would be, than Denisovans, and accords with confirmation of a lower autosomal divergence time between Neanderthals and Homo Sapiens than Denisovans and Homo Sapiens. I'd also second Africa (if she's saying what I think she's saying) that it seems interesting that the other African ethnicities relative to San are shifted along the Neanderthal-Denisovan axis in a Denisovan direction. But not obviously in a way that would indicate a Denisovan mix (i.e. they're not positioning closer to the Denisovans overall or along the Neanderthal&Denisovan-chimp axis, but just along the Neanderthal-Denisovan axis). Assuming that the labels are placed on the centroid(?) for each group. It looks to be that green Mr San probably represents the original human condition (between neanderthal and chimp). The rest of the Africans are shifted downwards and across towards Denisovans (most probably before out of Africa). The Out of Africa population are shifted towards Neanderthals (including the Melanesians). The Melanesians/Papuans are shifted closer to Denisovans again. The pic is PCA2:3? Why not PCA1:2? How much does PCA2:3 explain? No, it's 1 vs. 2, it's just that the variables were named thus, because the first column was the ID. It's a projection onto the PC1/PC2 space created by Neanderthals/ Denisovans/ Chimps - so sapiens has zero weight. If you didn't use Chimps, you would make the assumption that a PC2 between Neanderthal and Denisovans is meaningful. Also, the space occupied by humans is only about 2.5% in both PC directions - i.e., humans are comparatively very closely related, with African populations spreading about as much as non-Austronesian Eurasians (perhaps more if there were more data points, like the open green square may indicate). I guess one could do a similar projection but using, e.g., the San as the third population. Thanks for the data management and number crunching, Dienekes. The comparison with chimps is actually very interesting. We expect living African populations to preserve variations not found in contemporary populations outside of Africa. Thus, among living humans, Africans are more likely to preserve alleles symplesiomorphic with chimps. Of course, as Dienekes pointed out, all humans are equally related to chimps because. What creates the differences among living humans relative to chimps--when we measure on a genome-wide scale--are a relatively small number of SNP loci that have either different derived alleles or are shared primitive for some humans but derived for others. This is what makes the Denisova and Neandertal ancient genome data so significant, especially in the visualization Dienekes provides. Denisova and Neandertal genomes, both 50-40ka old, preserve a number of derived alleles (relative to the Chimp-Human LCA) that differentiate them from one another along PC2 and make them appear that much more different from chimps. This confirms that we all share mainly recent African ancestry, but it also highlights how much variation within the genus Homo has been lost during the Upper Pleistocene and Holocene, with recurrent population expansions. While I disagree with German Dziebel, then, concerning the fairness of the genomic comparisons, I fully agree that we need more ancient genomic data because it will help to anchor and interpret the comparisons. If we want to resolve the timing and scope of different population expansions--along with the role of admixture with local (perhaps archaic) populations in each--we need to get a better handle on archaic (African and Eurasian) sources of inheritance via admixture, as well as patterns of variation that have been lost. Dienekes: it would be helpful to know how much variation the first two PCs captured! Neat work. Since the sample size of Neandertal and Denisova are 1 each "you" have been speculating on how "hybridized" these samples may be. Then the admixture and distance results may include and even be dominated by the human part of these first samples. More data will reveal some of this. "Thus, among living humans, Africans are more likely to preserve alleles symplesiomorphic with chimps." This is a plesiomorphic expectation. It may have been set by Charles Darwin but it sounds pretty outdated now. Africans are more likely to preserve alleles synapomorphic with African hominins that we, unfortunately, don't have data for. You assume that somehow African humans carried chimp alleles intact for millions of years after the separation (chimps did the same thing in their own way), but then 50,000 years ago, as humans decided to colonize Europe, Asia, America and Australasia some irreversible allelic changes occurred. If the migration indeed happened, why did the accompanying genetic changes affect the African human-chimp symplesiomorphies but not the African human-African hominin synapomorphies? The reason I consider chimps-human-Neanderthal-Denisovan PCA unfair comparisons is because all humans should be equidistant from the chimps but each continental group would be closer to their own respective hominin to a varying degree. 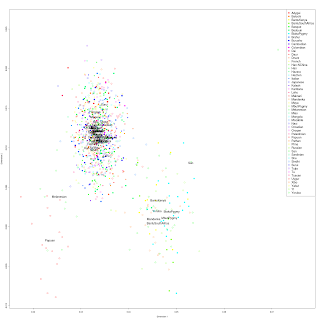 Then we'll need to understand if this proximity comes from admixture or common descent. "If Africans are closer to chimps, Eurasians to Neanderthals and Papuans to Denisovans, then Eurasians and Papuans are more modern than Africans, just like Neanderthals and Denisovans are more modern than chimps. Without ancient DNA from African archaics, it's not a fair comparative exercise." Chimps are actually more derived from the chimp-human common ancestor than humans are, so perhaps one would more accurately argue that Africans are more "modern". In your reasoning it also seems that Neanderthal and Denisovans were way more "modern" than Eurasians, which I think makes little to no sense, and I'm not trying to imply that Neanderthals and Denisovans were particular. It surprises me that Neanderthals and Denisovans are so far from each other and other humans. I reason that it may be that they evolved in smaller populations, more subject to consecutive bottlenecks, and in contrast, modern humans eventually reached more consistently higher population densities, then diverging in a slower rate, always remaining comparatively closer to H-W equilibrium. Nice work, did you use just SNP? If that's the case, where did you get the equivalent SNPs from the chimp? 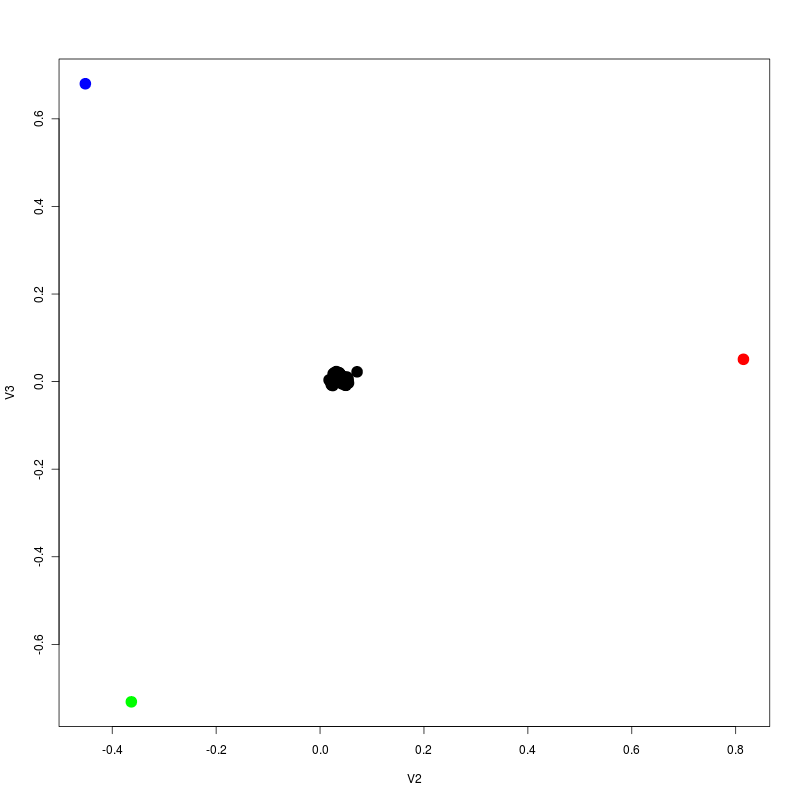 I want to run something similar but I cannot find anywhere chimp information appart from the whole sequence and I'm not sure of how to do an SNP calling that it it equivalent to the SNPs from Denisova and Neanderthal. I would appreciate your help in this matter, cheers! !